SurgihoneyROTM anticmicrobial wound gel is an approved medical device (dressing) for treating a wide range of acute and chronic wounds including: leg ulcers, diabetic foot ulcers, pressure ulcers, burns, skin graft sites and surgical wounds. SurgihoneyROTM (formerly known as Surgihoney) is a natural product that has been bioengineered to provide a managed and consistent level of antimicrobial activity. It supports the body’s defence system to combat infection and stimulate healing. 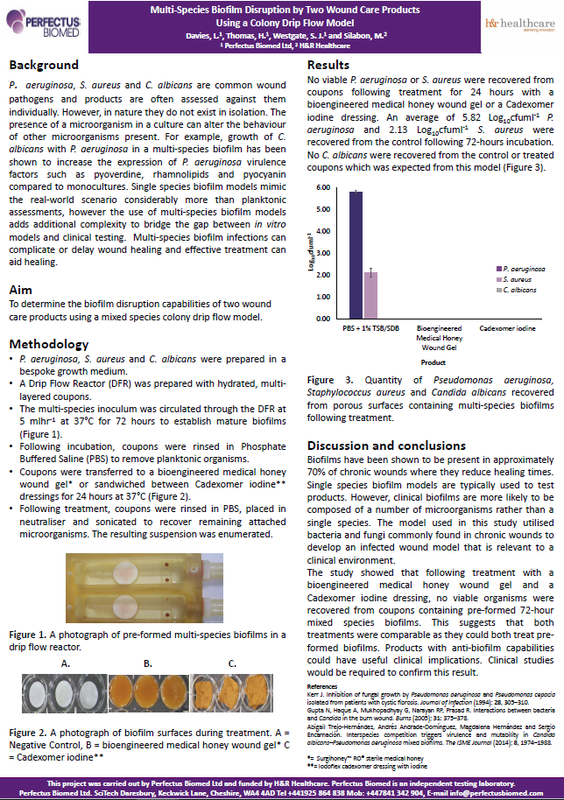 In a multi-centre clinical evaluation, SurgihoneyROTM was observed to help a wide range of wounds progress toward healing – leg ulcers, pressure ulcers, surgical wounds, diabetic foot ulcers and trauma. (16)Read the paper. Biofilms are communities of bacteria and other micro-organisms living within a self-secreted and protective matrix. The majority of chronic wounds are believed to contain a biofilm, which can impede healing and are highly resistant to antibiotics. 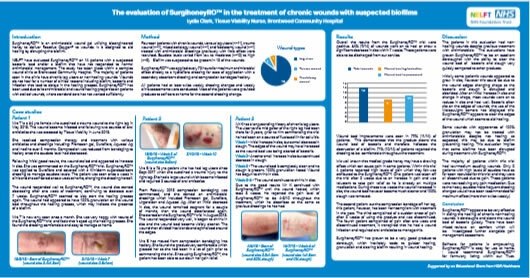 It is recommended that SurgihoneyRO™ is applied every 72 hours (3 days) and more frequently in critical wound infections to maximise effect. SurgihoneyRO™ may be used under compression bandaging for up to 7 days however potency will decrease after day 3. With a low therapeutic dose of H202 there are no contraindications associated with long term use and it is non-toxic to healthy tissue. It may be used on children. 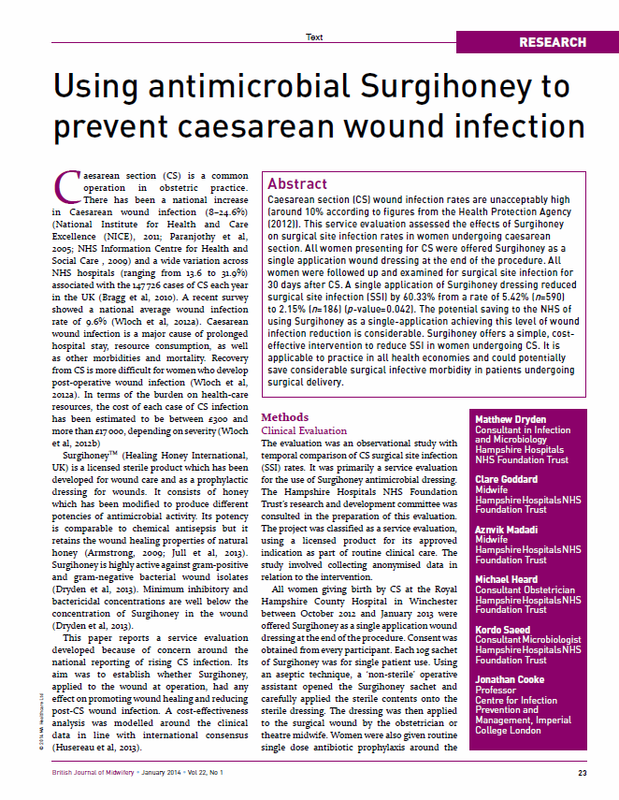 SurgihoneyRO™ is a safe and effective multi-action product without the drawbacks of other antimicrobial wound dressings. The bioengineering ensures a consistent level of therapeutically active Reactive Oxygen® which aids the antimicrobial activity for up to 3 days. Medical-grade honey is an established topical treatment for wounds and burns due to its antimicrobial and wound healing promotion activity. It provides rapid autolytic debridement, reduces odour and decreases wound-related pain and bio-burden2. Honey works in a different way to antibiotics – it is hypersomolar, restricting the availability of water to bacteria and dehydrating bacteria by osmosis. Natural honeys vary hugely in their antimicrobial properties and there is little consistency in antimicrobial effects because there can be no control over nectar source, sugar content and other contaminants in entirely natural products. 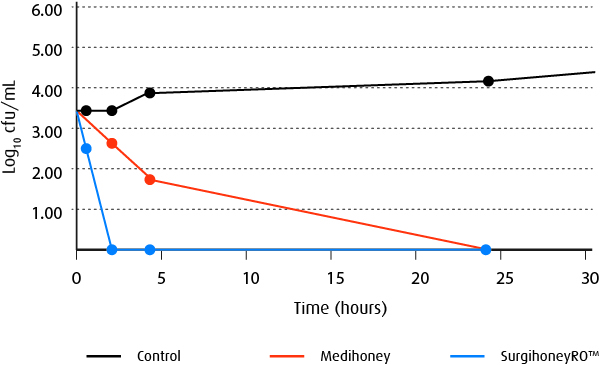 Many medicinal honeys are based on Manuka honey, which is one of the more antimicrobial natural honeys. 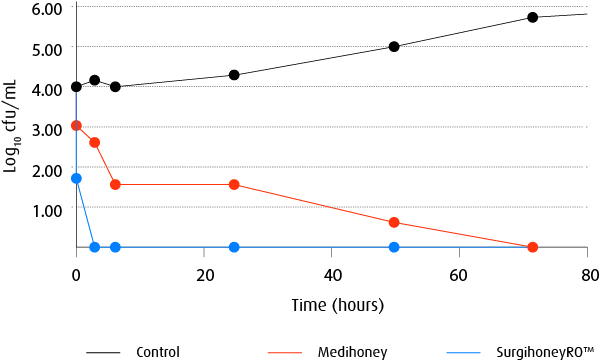 Different mechanisms of action have been suggested for the antimicrobial effects of honey, but the main ones are the high-sugar concentration, H2O2, the 1,2-dicarbonyl compound methylglyoxal (MGO), the cationic antimicrobial peptide bee defensin-1 and the low pH3. 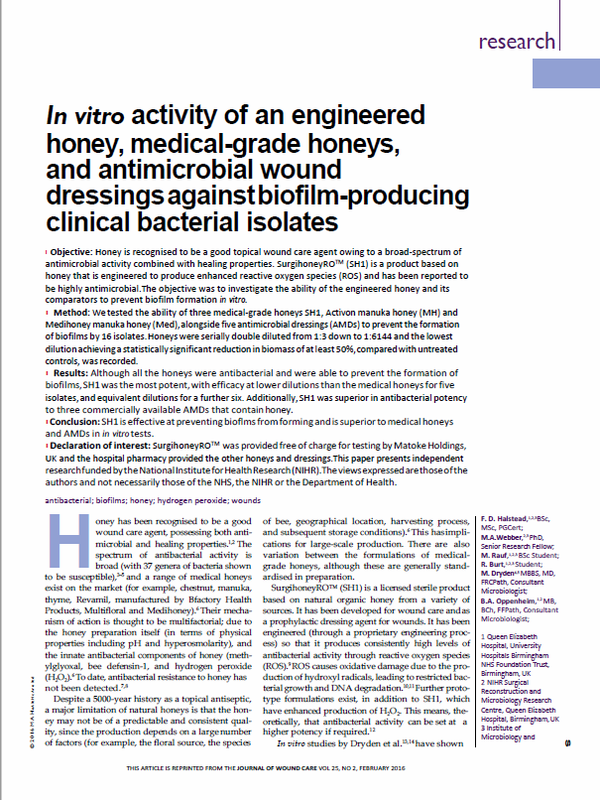 Some patients may experience momentary stinging or a drawing sensation when using honey therapies due to its autolytic debriding properties and the drawing of fluids by osmosis away from the wound4. SurgihoneyRO™ has all the natural healing-inducing, desloughing and tissue regenerative properties of the honey carrier, but it has been bioengineered to deliver precisely controlled level of Reactive Oxygen®. SurgihoneyRO™ is a fast acting, effective antimicrobial. SurgihoneyRO™ not only inhibits but also kills microbes at concentrations 10-1000 fold below those that are likely to be achieved in topical treatment. The speed of cidal activity is shown by the time-kill curves to be extremely rapid.4. The term reactive oxygen species (ROS) describes highly reactive molecules containing reduced oxygen or oxygen atoms with extra electrons. Members of the ROS family include superoxide anion O2–, peroxide O2–2, hydrogen peroxide H2O2. ROS are naturally occurring in the body. Basal ROS levels maintain normal cell functioning and homeostasis2, while increased amounts induce a cell-mediated antimicrobial defence response3. ROS are part of the innate immune response, and play a critical role in wound healing and infection control at the wound site4. They are released within minutes of epithelial injury, signalling rapid recruitment of leukocytes5. ROS directly damage microbes that invade tissues6. In wound healing, ROS are secondary messengers to many immunocytes and non-lymphoid cells, and regulate angiogenesis, haemostasis and tissue repair7. 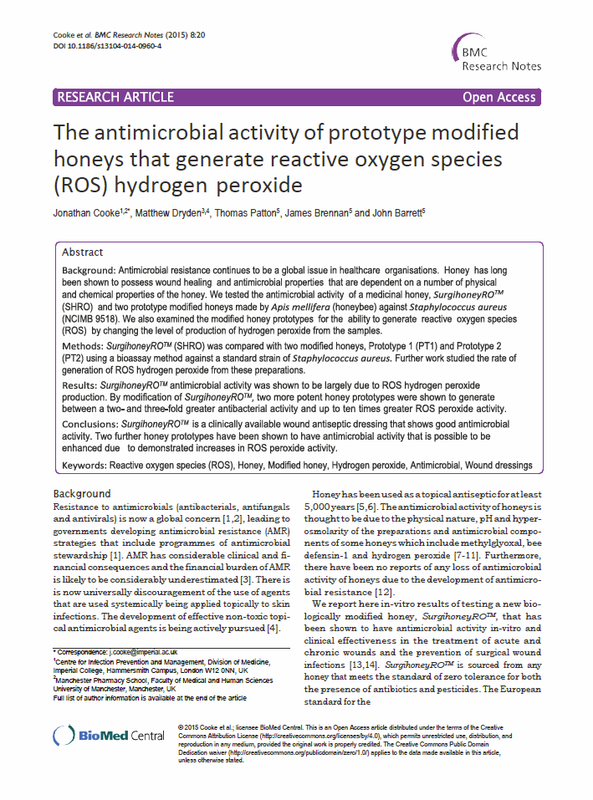 Reactive Oxygen® is the antimicrobial mechanism for SurgihoneyRO™. In contact with moisture, SurgihoneyRO™ releases Reactive Oxygen®. 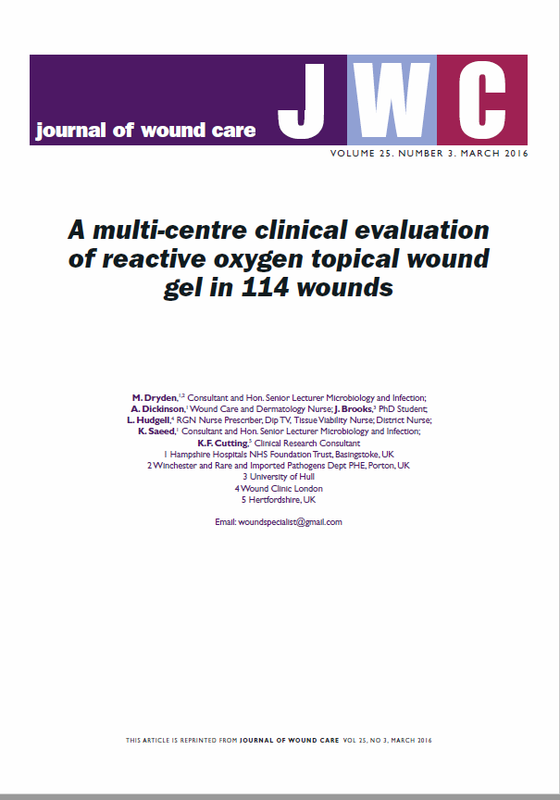 A controlled and sustained level of H2O2 that is non-harmful and non-toxic to surrounding tissue, is a therapeutic opportunity for wound care. SurgihoneyRO™ does this through the release of Reactive Oxygen®. 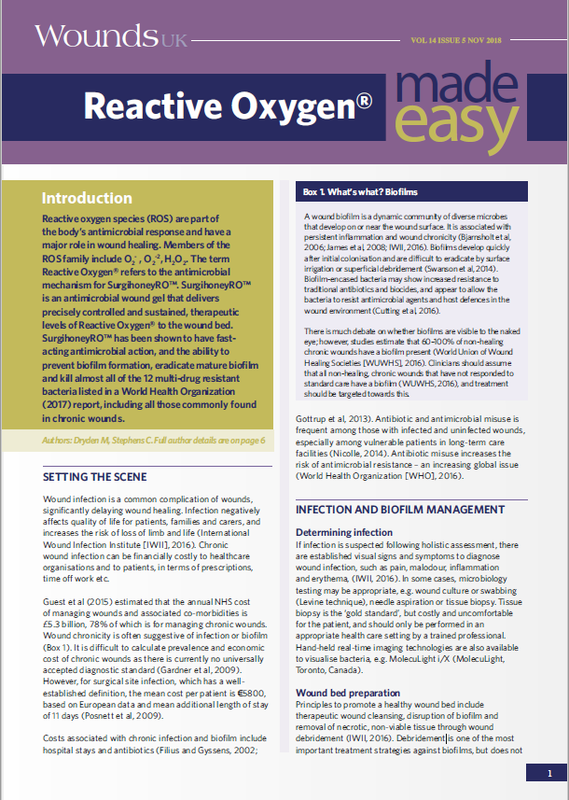 To find out more on the technology of SurgihoneyRO™ and Reactive Oxygen®, read the Reactive Oxygen Made Easy. 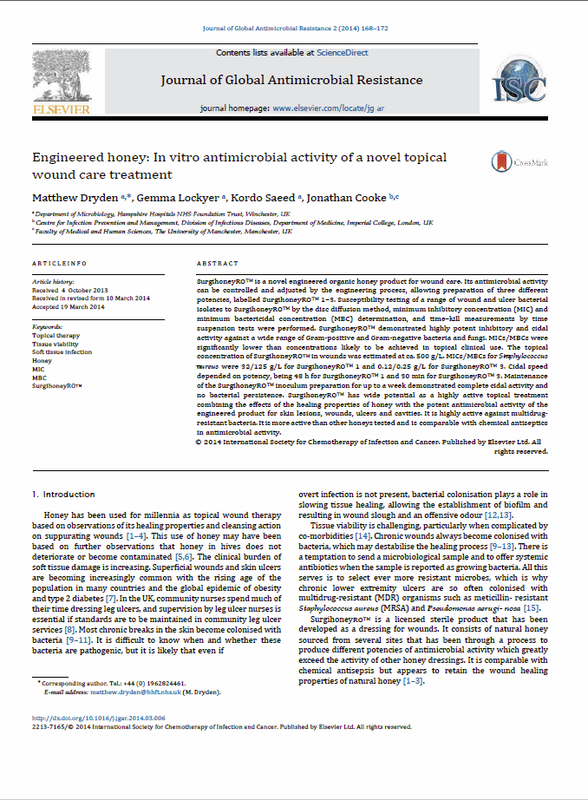 Scientists from the National Institute for Health Research (NIHR) Surgical Reconstruction and Microbiology Research Centre, the research arm of the NHS, demonstrated SurgihoneyRO™ is highly effective at tackling a wide variety of bacterial biofilm found in chronic wounds in vitro. 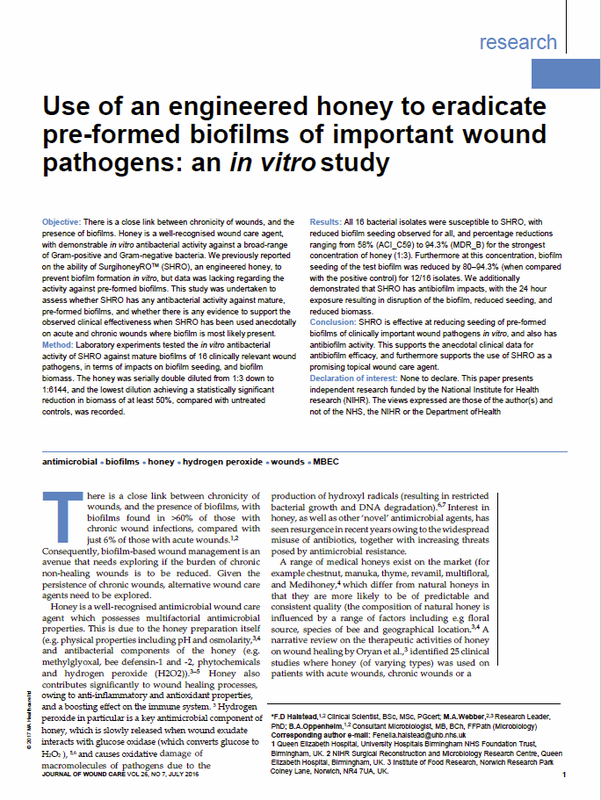 “Given the threat posed by antimicrobial resistance and the ever-increasing need to find new solutions to treat infections, SurgihoneyRO™ has real potential as a new wound care agent to kill bacteria and disrupt biofilm.” – Fenella Halstead, Clinical scientist, National Institute for Health Research (NIHR) Surgical Reconstruction and Microbiology Research Centre. 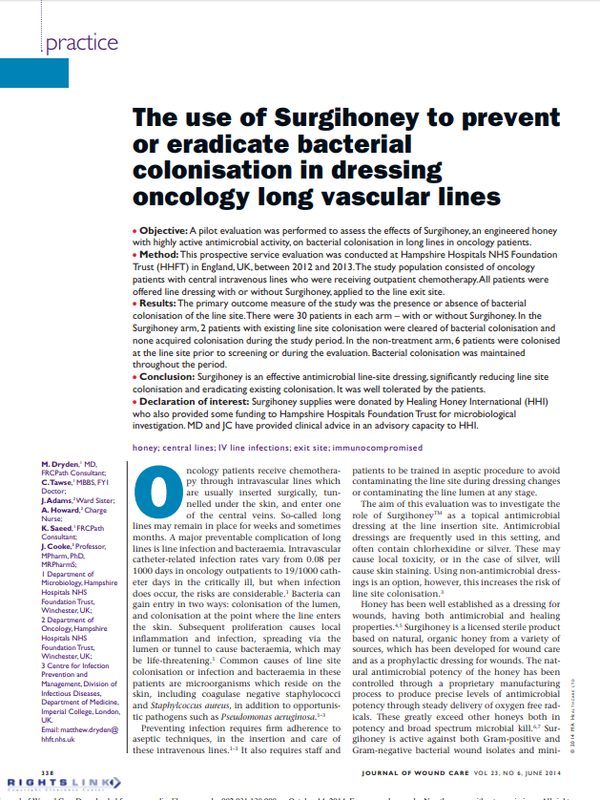 SurgihoneyRO™ has been successfully used for infection prevention, eradication of MDR bacterial strains and prevention of surgical site infections and intravascular line care in vivo15,16,17. 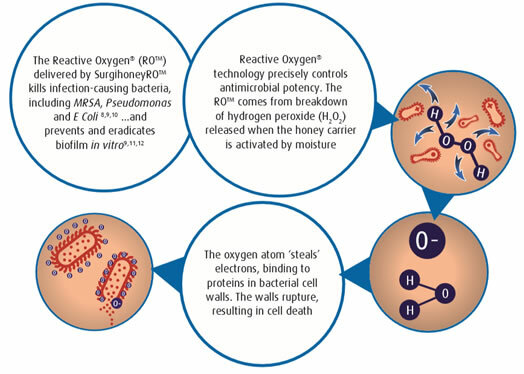 The Reactive Oxygen® released by SurgihoneyRO™ is a broad-spectrum antimicrobial against wound-relevant MDR bacterial strains and has been shown to prevent and disrupt and eradicate mature biofilm. 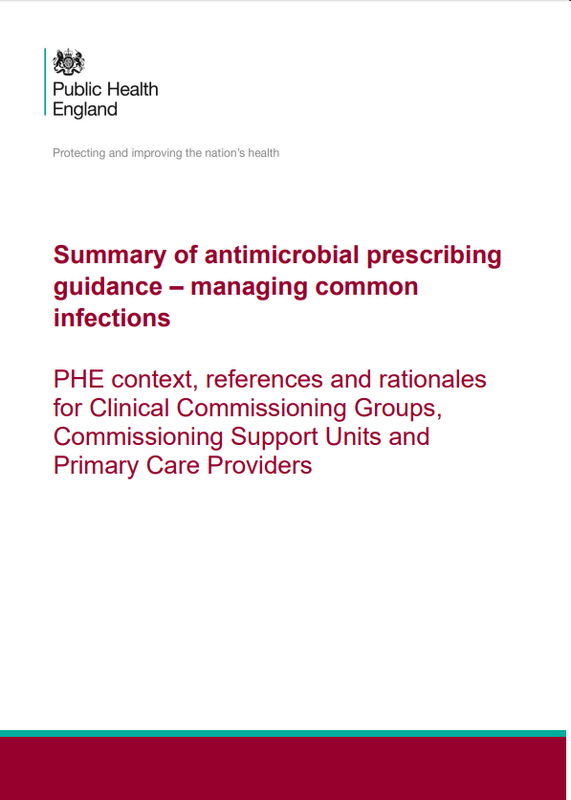 SurgihoneyRO™ presents one option against the growing global issue of antimicrobial resistance. SurgihoneyRO™ provides enhanced healing and a powerful antimicrobial action to reduce the microbial load thus removing the barriers to wound healing. Unlike other medical grade honeys, SurgihoneyRO™ has been bioengineered to enhance and precisely control its antimicrobial potency. 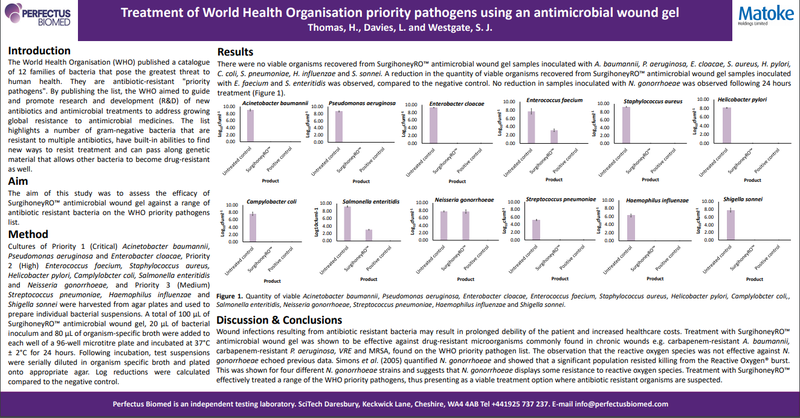 SurgihoneyRO™ is the only published, proven antimicrobial wound dressing tested against the WHO priority pathogens6. Surgihoney, Reactive Oxygen, Reactive Oxygen with atom logo, RO and RO with atom logo are all trademarks of Matoke Holdings Limited. We are committed to respecting and protecting your privacy. By ticking the box you are agreeing to your personal details being added to our marketing database. We may contact you in regards to new product releases or our E-newsletter. We will keep your personal information securely for as long as we need to for this purpose.